This post was originally published on Kotaku on August 28, 2009. To celebrate Mass Effect week, we're bumping it up! 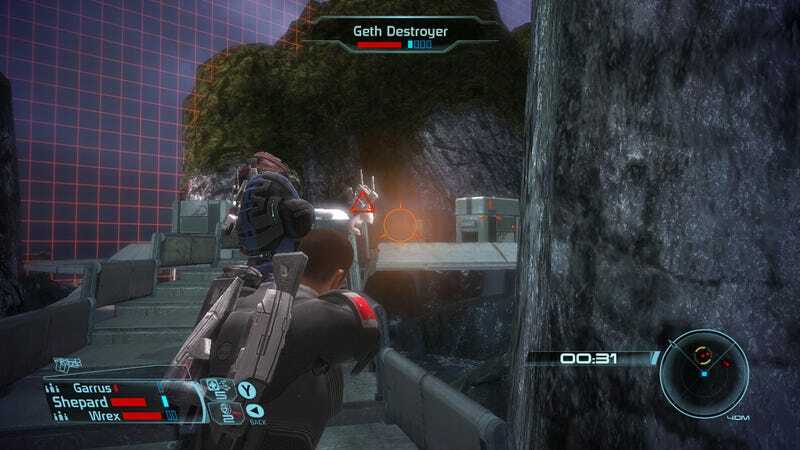 What if Mass Effect was multiplayer? What if there was a way to get a taste of that, even if it was just in a solo mode? Now, strangely, there is. Mass Effect: Pinnacle Station is the barely-hyped second downloadable expansion for BioWare's 2007 sci-fi game, a brief, belated and broken extra for a game already bursting with content. It's an expansion about which I have more negative things to say than positive. But I like it. Odd? Yes, well so is the content, which is a hint at, of all things, the multiplayer potential of Mass Effect. Little and Late Yes, I like that this is a small oddity. I like that this is a drip of an expansion that got me playing Mass Effect, for just three more hours, 14 months after I last touched the sci-fi game. We can have our DLCs that meaningfully add new satisfying adventures to our favorite titles, that offer new modes of play or new maps to explore. But I'm happy to plunk five bucks down on what feels like an experiment. All Pinnacle Station entails is a trip to a space station in an asteroid belt and, in that station, 13 combat missions set up in a holo-deck-style simulator. Missions are set in five geologically distinct, walled levels and require the player to do one of the following: Kill a set number of enemies in a time trial; kill as many enemies as possible with each kill adding seconds to a countdown clock; gain control of a set number of checkpoints; or survive waves of enemy attacks as long as possible. These are the standard tasks not of the sprawling single-player role-playing game adventure that we knew to be Mass Effect but of many a multiplayer mode in other games. Play it. Imagine your AI squadmates are controlled by people and you too will be able to answer the question: Hmm, would I like Mass Effect as a multiplayer game? Kobayashi Maru: I think I'm on to some meta joke that BioWare is pulling. Star Trek lore includes the Kobayashi Maru, an impossible computer-simulation scenario that only a cheater can win. I could describe Pinnacle Station the same way. The DLC requires that the player place first in each of its simulator challenges in order to complete this mini-adventure, but the missions are tuned in strange ways. Some missions are a cinch at the default difficulty. A few required me to drop the combat challenge to "novice" and then breeze through. I was using a Level 50 character for this, and, glancing around the Internet, I am not the only one doubting this DLC was properly balanced. An Advertisement For The Future: Bring on early 2010 and Mass Effect 2, so I don't have to relive anymore the original game's awkward texture pop-in, un-interruptible dialogue, slow loading, awkward pause-based combat, and cumbersome inventory system. All being fixed for ME2, right? Please? This DLC doesn't fix Mass Effect's annoyances, not that I expected it to. Pinnacle Station is similar to Fable II's See The Future pack in that it's kind of crazy. It is not a satisfying addendum to a beloved adventure but rather an unneeded appendix some bizarro-surgeon decided to put back into the organism. That's why I liked it. And, yes, I'd take some Mass Effect multiplayer if there's any to be had.